Have you ever thought about what it would be like to move your homestead 800 miles across the country? What about what items you would take with you if you had to move and had limited space? Like many people we dream of expanding our homestead and “really homesteading.” While I won’t discount what you can do on a small space we like many of you want more. We want big gardens, pasture for larger livestock, and a home of the grid all for a cheap price tag. So when we got the opportunity to move build on 300 acres with Scott’s family we took it. You can read more about our decision here. Now onto the how-to behind our journey. Can I live without this item? Is this item replaceable for cheap or free? Will this item help me create my new life and homestead? Does this item have a lot of sentimental value? This allowed us to narrow down what we felt we needed to bring. Things that got guaranteed spots were our animals, our tools including some hand tools, two chainsaws, and some of my kitchen tools, fencing, and practical clothing. We then thought about items that would fit that would make our life easier or more comfortable if we had them immediately like our hoop house and mattress. Obviously this will be different for everyone depending on your moving situation. For us every square inch of space had to be utilized effectively as we only had our old Chevy S10 to move all of our belongings in. We had several people compare us to the Beverly Hillbillies. Divide up your space. We created a second floor from plywood and 2″x4″s in the truck bed at the level off the top of the wheel wells. This left plenty of space for the chickens and ducks on the second floor with room to pack our belongings below it. Pack big solid items first then stuff smaller and softer items in around them. It made it harder to unload but we left all of our shoes and some blankets loose to stuff in around boxes and tools. Get creative. We tied some off the hoop house pipes and fencing to our roof then tied our mattress over them to help hold them in place. We also tied some of the pipes to the inside top of the truck cap above the animals heads and strapped suitcases onto the open tailgate. As I mentioned previously our entourage included ducks, chickens, rabbits, and a dog all of which made the trip more challenging. Bring all the animals’ favorite treats. Sometimes stressed animals don’t want to eat but on a long trip its important that you ensure they do. Stop frequently to provide water. Our rabbits had access to water the whole time but for the dog and birds it was difficult to keep their bowl full. Travel at night. Due to the 90 degree weather it was best for all our animals and us (the truck has no AC) to leave in the evening and drive through the night. Pack and plan ahead of time. It seems obvious but make lists. You don’t want forget to do something until the minute its time to leave. Ensure all your animals are healthy for the trip. Get them vet checkups, remember to pack any medication they may be on, etc. Give your vehicle “the works” before leaving. Make sure you change the oil, fill the tires (including the spare), etc. 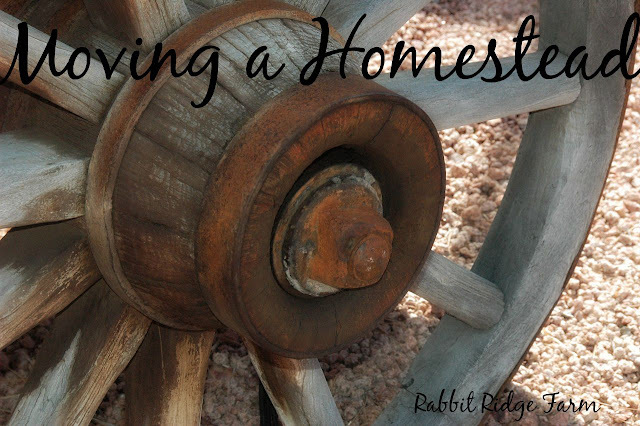 Have you ever moved your homestead? Please comment your best advice.